Every week we'll be keeping you up to date with all the new products and deals that we've sourced. We're always on the look out for new products, exclusives and close out deals and each week we'll bring you the latest and greatest. San Marco's Zoncolan Saddles are named after the infamous Giro d'Italia climb, last conquered by Michael Rogers in 2014. This broad range of race ready saddles covers all the options you could require and packs in plenty of technical features. Weighing in between 210g and 152g there's a Zoncolan saddle for every rider. From their lightweight tubular carbon railed FX Open model to their Cro-mo railed and extra padded Power model, there's a Zoncolan for every purse and every riding style. San Marco has pulled out all the stops for the Zoncolan saddles; Biofoam padding provides lightweight, durable comfort for long days in the saddle. CFRP- carbon Fibre Reinforced Polymer shells deliver ergonomic support mile after mile and feature a cut-away side cheek design that eliminates chafing and helps you to maximise your power output. If you find yourself constantly shifting around on your saddle during longer rides searching for the comfort zone then you owe it to yourself to trial the San Marco Zoncolan saddles. Our personal favourite is the Carbon FX Open, it's ready to tackle any ride and deliver you to the end in comfort. dznuts is the brainchild of ex-pro rider Dave Zabriskie. With 13 years under his belt as a pro-rider for US Postal and Team CSC he was the first US rider to win stages in all 3 Grand Tours so you know that just like most of us he's experienced his fair amount of saddle soreness. Zabriskie took it upon himself to come up with a solution to the age old problem and while he was at it come up with a range of pre-ride embrocation- with a kick, as well as a female specific chamois cream and a unisex shaving cream. Top Tip don't mix up the HOT embrocation for the chamois cream- that'd be a tear-inducing mistake for 30 minutes at least. Where dznuts really differs from most of the currently available chamois creams is in its contents. Zabriskie's products major on naturally sourced and organic ingredients along with the highest quality base compounds. dznuts are clean, none sticky and seriously worth investigating. Summer's here, we need all the protection we can get. Vittoria is one of the oldest bicycle tyre manufacturers in the world, their tyres have been ridden to more Grand Tour victories than any other brand, maybe even all other brands put together. Though they are thought of as primarily being a manufacturer of hand made tubulars during the past couple of season's they've put their lab coats on and mixed up an incredible range of new rubber compounds featuring the hi-tech buzz material Graphene. Graphene is composed of platelets of pure carbon only a single molecule thick. It can be used to replace carbon black in vulcanised rubber and gives the finished product some remarkable properties. Vittoria claims that Graphene has increased the durability of their tread compound, increased the grip and the wet weather braking performance. Not only that they've already been proven to offer a significant reduction in rolling resistance which makes their Corsa G+ Graphene tubular their fastest and longest wearing road race tubular tyre ever. If you're looking for a racing advantage this season we can't think of a better tyre. For tourers and commuters, we have the Rubino Pro Endurance G+ and the Rubino Pro Control G+ tyres. These come in sizes from 23-28mm and offer up to 16% more wet weather grip, lower rolling resistance and incredible puncture resistance from Vittoria's well proven PRB Poly-Breaker system. The Pro Control G+ has been incredibly popular as a tyre upgrade option with our London Road and Bish Bash Bosh bikes. We're just waiting on our first delivery of Vittoria's brand new Open Corsa Speed G+ Graphene TLR tubeless ready clincher. We've already tested this remarkable clincher tyre and their tubeless performance is mesmerising. Lightweight, only 205g for the 23mm and with lower rolling resistance than any clincher Vittoria have ever made these are sure to be a smash with any racer who isn't wedded to tubs. 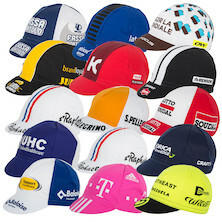 Apis are the best-known manufacturer of cotton cycling caps, they've been covering the heads of professional cyclists for over 50 years. Based in Cremona Italy, they hand make all their headwear and adhere to the classic proportions that make their cycling caps immediately recognisable on and off the bike. Apis pride themselves on their production heritage, Cremona was made famous in the 16th century by its luthiers, such as Stradivari and the Guarneri and Amati families and the violins and cellos that they produced, today it is known for the production of the finest cycling caps and clothing accessories. For the 2016 season, we've added new trade team caps from AG2R, BMC, Etixx Quickstep, Gaint Alpecin, Fassa Bortolo, Katusha, Lotto Jumbo, Lotto Soudal, Orica Greenedge, Orica Southeast, San Pellegrino, St Raphael, T-Mobil, Topsport and United Healthcare. Choose your favourite and wear it with pride. In 1981 Giovanni Battaglin became only the second rider, after Eddy Merckx, to win the Giro d'Italia and Vuelta a España in the same year. The year after, Battaglin Cicli was born as he established his own bike manufacturing business in Italy where he continues to be involved testing bikes and key product decisions. Giovanni Battaglin is a good friend of Planet X and is coming over next week to watch the last few stages of the Giro d’Italia with us. We thought we would make the most of the visit and throw a bit of a shindig, put the Giro on the big screen, drink some beer and eat some good food (more details to follow). As well as the Giro on the big screen, we're also selling the last remaining warehouse clearance products for one final day.